What Is the Best Material for the Top of a Bathroom Vanity? Laminate countertops are a common choice for many homeowners due to the variety of colors and styles available at affordable prices. According to "Counter Point: Laminates are Still Tops in the Kitchen," in the Jan. 21, 2006 issue of "Building Products" magazine, homeowners are twice as likely to choose laminate countertops over natural granite or solid surfacing materials. High definition laminate countertops provide an alternative for homeowners who are on a tight budget, but want a finish that mimics the look of expensive natural stones, such as granite and limestone. High definition laminate countertops have a look and feel similar to natural stone. Similar to regular laminate, there is a wide range of surfaces, edges and sinks that consumers can choose from when selecting high definition laminate countertops. For example, homeowners can choose between laminate that has the appearance and texture of aged stone, sandstone, travertine or slate. High definition laminate also comes in colors ranging from orange and beige, to blue and yellow. Manufacturers give homeowners the option to select counter edges based on their personal taste, or to match accents from their kitchen decor (see Resources). These include wooden edges, no drip edges, waterfall edges and full-rounded edges and flat edges. High definition laminate countertops can also be matched with sinks that have single and double bowls, or are rectangular and round-shaped. 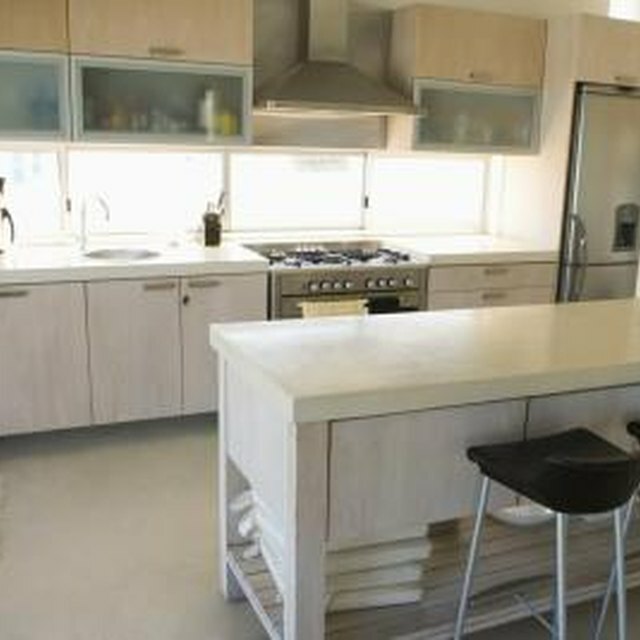 The overarching benefit of choosing high definition laminate countertops is the cost. Laminate is easy to install and less expensive than natural materials. It is also more versatile. There are a plethora of colors, patterns, textures and edge styles to choose from when selecting high definition laminate counterparts. Compared to regular laminate, they are more durable, require less maintenance during cleaning and are three times more water resistant than most laminates according to "Building Products" magazine. High definition laminate is also bacteria-resistant, can be cleaned with gentle household soaps and detergents, and is less expensive than natural stone to repair. Although high definition laminate lasts longer and is much stronger than regular laminate, it is still susceptible to deep scratches and damage from abrasive materials and sharp objects. Homeowners must be careful when placing hot kitchen items on the counter, since laminate can be scorched when exposed to high temperatures. Also, seams -- the joints that connect and support the slabs of laminate -- may be more apparent depending on the counter’s pattern and design. Although builders will recommend that homeowners remodel kitchens with high definition laminate due to its widespread appeal and low cost, remodeler David Cowely recommends that consumers avoid installing laminate on areas such as kitchen floors. Though high definition laminate looks similar to natural surfacing, real granite and other natural stone are still considered superior in the home remodeling industry. In "Building Products" magazine, Cowely remarks that using high definition laminate, “keeps the expense of kitchens down, even though the national materials [like stone] will sell a kitchen faster than the laminates”.